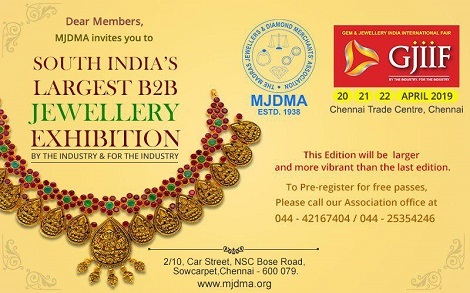 Gem & Jewellery India International Fair will allow the domestic and the global gem & jewelry sector an excellent business opportunity to explore various multi-faceted aspects of the Industry. It features Gold Jewelry, Platinum Jewelry, Fine Jewelry, Silver Jewelry, Antique Jewelry, Diamond Jewelry, Gem set Jewelry, Pearl Jewelry, Precious Stone Jewelry, Semi-Precious Stone Jewelry & Cultured Pearl Jewelry and etc. Exhibitors Profile: The exhibitor will showcase Precious stones, Equipment and accessories used for jewelry making, Gold, Pearl, Emerald, Crystal, Ruby, Sapphire, Diamonds, Gems, Coins, Estate jewelry, Antique jewelry, Gemstones, Lapidary tools, Beads.